It’s also entirely possible that the person who did the sound editing for the intro was making their own insider sound-nerd joke. Nerds abound in Colbert-land. The Colbert Report was my first thought, too. I’ll keep an ear out for specific examples. I usually associate it with people being lost in a desert, just so you know there are birds around who will eat you when you collapse. This sound shows up in World of Warcraft. 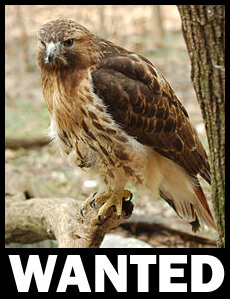 For example, if you have a hunter character and switch it to use “Aspect of the Hawk”, the sound effect includes a hawk cry. Oh, just heard it, rewatching Cabin In the Woods! It shows up when the camper is going through the tunnel. But, as the rest of the movie, it’s making a comic nod to its ubiquitousness, so that’s kind of awesome. The new Ballpark Franks commercial “So American you can taste it”. It’s probably on youtube. It drives me crazy how often they use a hawk whistle for a bald eagle image, so much so that I looked this up and found your website!!! Don’t know if this is still active, but the kid’s movie, ‘Book of Life’, has the sound effect when the Channing Tatum character, Joachin, is preparing to fight the bandits. Oddly, it’s at night, and I believe only owls do the ‘death from above’ deal at that hour! Don’t forget that velociraptors are raptors, too. Only it’s more like, ‘death from behind, then from above’ with them.